The sun's activity waxes and wanes periodically and holds sway over our space environment. Sunspots, strongly magnetized blotches on the solar surface, sometimes release fierce storms in space that severely impact our satellite based communication and navigational systems and occasionally, render satellites useless. However, a complete understanding of all aspects of the sunspot activity cycle remains elusive. One of its curious features is the long observed lopsided activity of its two hemispheres. Sometimes, the northern hemisphere becomes more active, sometime the south, with no apparent way to predict when this might happen. Now, a team of scientists from the Center of Excellence in Space Sciences India at IISER Kolkata and the Tata Institute of Fundamental Research in Mumbai have uncovered a hitherto unknown link between plasma jets in the sun's interior and the sunspot cycle which may foretell the unequal activity of the sun's hemispheres. Plasma material at different locations inside the sun rotates at different rates powering a dynamo mechanism that creates the magnetic sunspots. The rate of rotation has been earlier observed to change with time with faster and slower streams of plasma jets known as torsional oscillations superposed on the average rotation. These jets accompany the progress of the sunspot cycle with their patterns of migration similar to those of sunspots on the sun's surface hinting at a causal link. In a paper in the Astrophysical Journal of the American Astronomical Society, Lekshmi B., Dibyendu Nandi and H.M. Antia report that asymmetries in plasma jets just below the sun's surface precede asymmetries in sunspot activity by about a year, a discovery with no clear theoretical explanation yet. "The strength of the sun's torsional oscillation is very small compared to the differential rotation thus making it difficult to measure. Our careful analysis covering 16 years of both ground- and space-based observations has allowed us to discover this link" said graduate student Lekshmi B. The team used a technique called helioseismology which observes oscillations on the sun's surface that are produced by the propagation of acoustic waves in its interior. Through use of helioseismic techniques, plasma velocity changes in the sun's two hemispheres are then teased out. "Our study probes only the near-surface bands of faster and slower rotation. However, the current consensus is that magnetic fields that form sunspots are created deeper inside the sun. 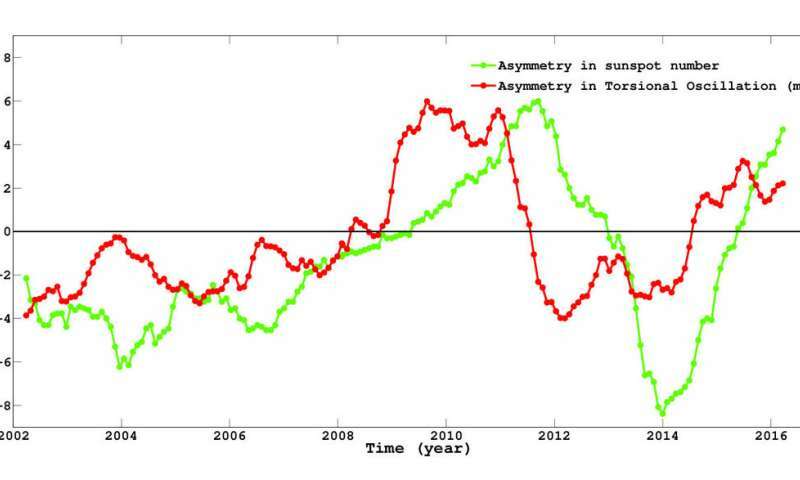 It is extremely intriguing, therefore, that the sunspot cycle asymmetry is mirrored across the vast depth of the sun's convection zone linking the deep and the near-surface layers of the sun" said Dibyendu Nandi who supervised the research in collaboration with H.M. Antia. "This may be an early manifestation of the creation of magnetic fields deep within the sun and may lead to techniques for predicting its hemispheric activity levels" he adds. 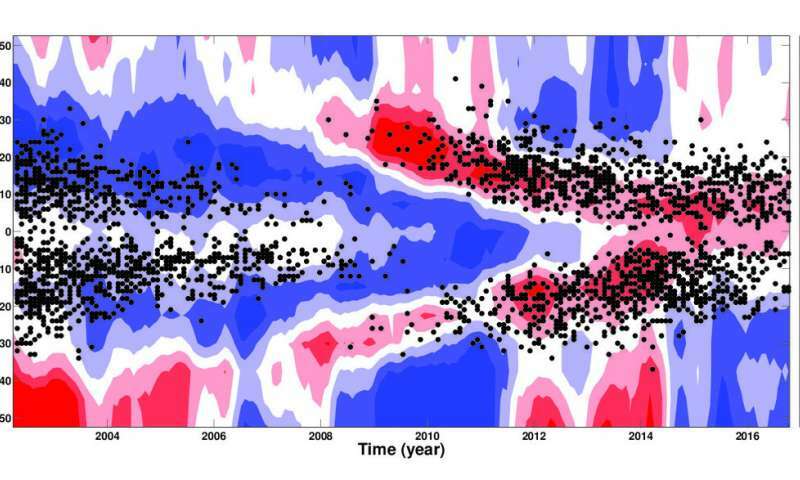 For this study, the team used ground-based data from the Global Oscillation Network Group—a multinational consortium of observatories involving USA, India, Spain, Australia and Chile, and space-based data from the Helioseismic and Magnetic Imager instrument onboard NASA's Solar Dynamics Observatory. This research was sponsored by the Ministry of Human Resource Development, Government of India, NASA Heliophysics Program and the Indo-US Science and Technology Forum and appears in the 12 July 2018 issue of the Astrophysical Journal published by the American Astronomical Society.